As the first floor of concrete work nears completion, a new project within the North Loop prepares to ascend into the sky. 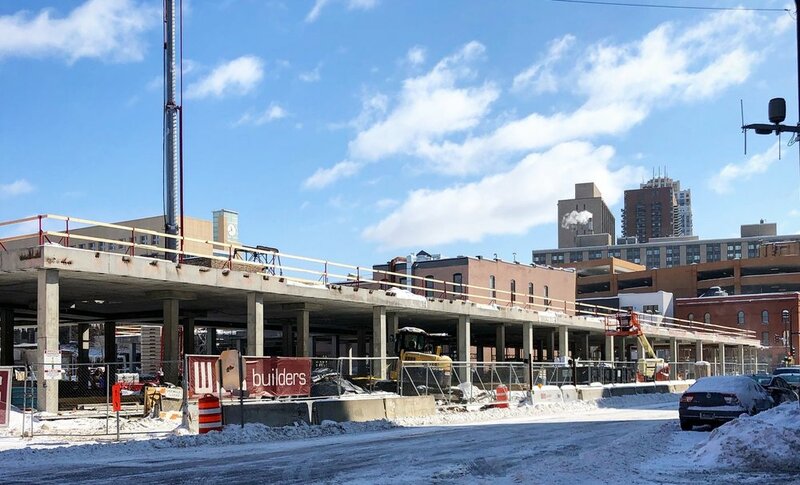 Second & Second is currently under construction at a site that was previously a surface parking lot at 128 N 2nd Street in the North Loop. The new mixed-use building will bring 158 apartments and 20,000 square feet of ground floor retail space to the neighborhood. Multiple levels of underground space will provide parking for both residents of the building and guests of the retail spaces. Retail space and the residential lobby will be located on the ground floor of the building with the upper levels being home to apartments and resident amenities. A unique design element of this project is an outdoor plaza that will run centrally through the site. The “connector” will run at street level connecting N 2nd Street to what eventually will be the Foundry mixed-use project behind Second & Second. Second & Second will sport a modern design and will stand six stories tall once complete. Snow Kreilich Architects designed the building, which will be clad in dark brick, metal accents and multiple illuminated elements. Weis Builders is the general contractor constructing the building and Colliers International is the broker marketing the retail space, which is available spaces between 1,100-14,000 square feet. Construction on Second & Second is anticipated to be complete in fall 2019. © 2019 The Development Tracker. All rights reserved.